I’ve received a lovely report from a happy customer that I want to brag about. We were in need of purchasing some new Tooke Gages, but were not happy with the measurement increments on the universal scope. After reading on the Micro-Metrics website that they were able to rebuild old Tooke Gages, we decided to take a chance. We received the finished gauges yesterday and could not be happier. We sent 4 gauges in for repair and when we got the quote back, one of the scopes was unrepairable, but Elenor stated that she would try to find some pieces from old gauges to make it work. We received all 4 gauges back just as good as new. 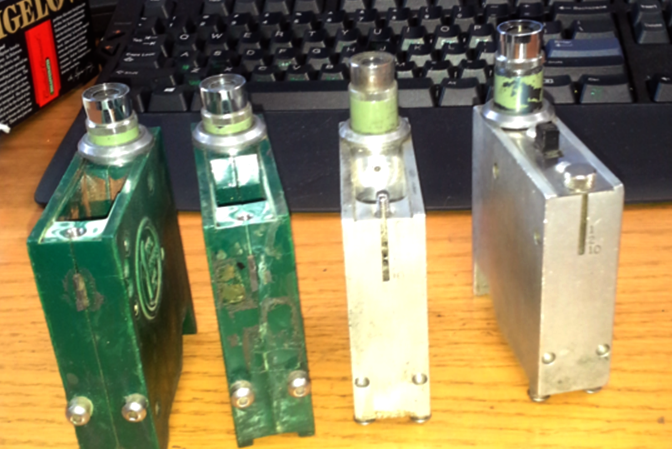 We had 2 plastic gauges that got the free plastic body and 2 metal gauges which we had transplanted into new bodies. We would highly recommend that anyone having broken gauges with the old scope to send them in for repair. We would also recommend getting the plastic carrying case for extra protection. Thanks Dena, I was very happy to put your gauges back in working order! My plastics-guy says there was some problem with the green dye and the plastic matrix, which occasionally results in the plastic cracking around the tip slot screw holes. If your company has an old green-shell OG204, please know that I am replacing the shell under warranty, you just pay shipping (and any missing parts). Of course, this makes it not cost-effective to get a Body Transplant for a green-shell Tooke Gage, but you will still have effectively a new gauge. If you have an old Tooke Gage (either metal or black-plastic body) that you’d like to upgrade and update, please see the Body Transplant page. This entry was posted in OG202, OG204, Swap Program on 18 May 2016 by Elenor.